I take the train to and from class every other day, the train ride is an hour and a half both ways, in order to keep myself entertained while on the train I've been loading up a bunch of anime on my Vita. This week has some pretty big surprises in store! The new season has started and I wanted to give my impressions so far. This one's a super sized post because I tend to watch a whole bunch of shows at the start of the season and then continually whittle them down until just a few remain by the end, surprisingly not so many have been whittled down yet :3 So here's part two of the Trainime impressions for this season. Oh and here's part one. Part three begins here! Two episodes of the show have aired since my last volume of Trainime new season impressions, so you get a double whammy here. The second episode did something that an anime hasn't made me do in a long time. I watched it last monday night, and enjoyed it so much that I went out and read the entire manga run so far to see where the story went next. All 70 chapters. I don't even think the anime was perfect or anything either, it just left you on such an incredible cliffhanger you really wanted to know what would happen next. And the whole episode had this incredible energy to it that just kinda jazzed me up. Episode 3 was yesterday, and it delivered pretty much exactly what I wanted from the episode: a satisfying conclusion to the cliffhanger from the previous episode (even though I knew what was coming from my manga binge). It's style is quickly going from something I didn't know if I liked to something I find quirky and charming. It also introduced a new character at the end of the episode with what I think is the perfect voice actor for the character, totally how I imagined him. There was less racing this time round, so it gets a mark detracted for that. Episode 28 was pretty standard fair for the first half, focusing pretty heavily on comedy and getting ready for the Winter Cup and then kicked itself into gear. It was nice to see the seniors and characters other than Kuroko and Kagami getting the spotlight for an episode, especially when it's Tippei, dude's a laugh riot and has some pretty cool moves as well. I didn't like when the narrator butted in, mid episode, and explained a moment that really didn't make much sense anyway. 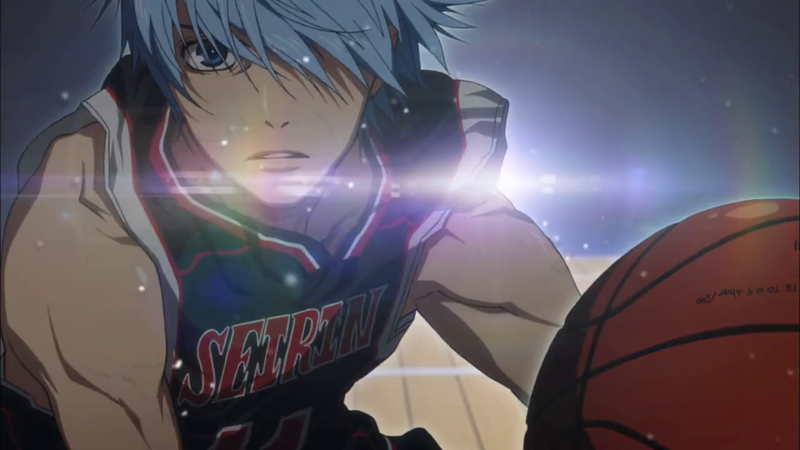 But, it was a good episode and it showed how much of a powerhouse Seirin is. Dat Ending O.O This episode was one of the highlights of the week, if only for the surprising ending it left off on. It started off strong with some more relationship building for the two main characters and a tiny bit of fleshing out for some of the other side characters. It threw in some action and dealt with the ending of last week's episode. And then the ending 5 min started, and everything went bonkers. I can't wait to see what happens next week O_O I gotta say I'm liking this one more than I thought I would. The more I go through the episodes for the week, the more I realize how good this season is compared to a lot of the other seasons recently. I'm starting to really enjoy Golden Time as well. I think I actually just saw an anime parody Scientology?! And the light laughs to go along with the subtle drama of the show are really starting to show their strengths. Banri-kun and Kaga-san have their depths revealed to a small extent this episode. Which is great, at first I thought oh great another character with selective amnesia, but for whatever reason it works here. Plus I'm continuously wondering when Kaga will get over Mitsuo and start noticing Tada, because c'mon it's in the OP for the series, but that really works for the show as well. I give Episode 3 4/5 trains. Now this may be a little polarizing, but I really really did not like episode 3 of Kill la Kill. I felt that it gave off mixed messages about what it wanted to be and felt a bit shallow over all. I think if it had just brushed off the fanservice element as just being there I wouldn't have criticized it as harshly, but because they highlighted it themselves, it brings it to attention and I felt the way they handled it lacking, but I mentioned this all in the response to _AFI's discussion piece. TL;DR I didn't like it much, but the show's still super pretty and entertaining on a very shallow level. I give episode 3, 3/5 trains. This series moves at a slow pace, but to be honest that's not a bad thing at all. This show has completely taken me by surprise and has been one of the standouts of this already stacked season. Hazama continues his foolish quest to become a real life superhero this week, and the show introduces some more side characters beside Hazama and Goto, We meet the character who looks to be the love interest?/Female Lead?/Sidekick? character (I've included question marks because all we know so far is that she'll be important to the series and this show throws a ton of surprises in at every turn so who knows how it'll turn out?) One of the things that I love about the show is it's telling a story that really hasn't been told before in anime and it's kinda surprising at every turn, it's well acted and well written with a clean realistic style to the animation. I give this episode 5/5 trains. I was not overly thrilled with episode 3 of Ace of the Diamond. It's a good episode and it's kinda unique for the sports anime genre, but for the most part it was a lot of talking and not a ton of baseball. Eijun continues to be the best part of the series, and his antics/straightforwardness really is the highlight of the episode. I'm really hoping for a practice game or for them to continue to introduce the supporting characters that show up in the manga in the next episode or two, we've seen glimpses of them, but nothing concrete yet. I give this episode 3/5 trains. Log Horizon continues to astound, this series is edging ever closer to being my favorite series of the season, it goes further in developing an interesting cast, with the addition of Serara, and the cat dude, who we still really don't have much information on. This time we go underground to a location reminiscent of Moria with some interesting questing through this area, we also see the state of the other city we know of so far, it doesn't look good if you want to know :3 Akatsuki continues to be the best part of this series, she is quickly becoming one of my favorite characters. Hopefully her character continues to be awesome throughout the season. Learning about Mirai's past is the best part of this episode, well no not actually the best part like always is how absolutely gorgeous it is. We get some insight into why Mirai refuses to become integrated with Akihito's group of friends and a bit about her tragic relationship with a childhood friend. This all leads up to a somewhat confusing revelation, and an awesome battle! The fight this week was totally fluid and Akihito actually did something cool for once :3 I'm sure they'll explain what the reason for said revelation was next week so I'm really looking forward to it. NouCome episode 2 had a interesting set of gags to it, and if you don't take the show too seriously you might enjoy it. I'm not super high on the series, but as far as harem shows go, it's got an interesting premise and is pretty funny as far as things go. The character designs are nice, and I'm probably going to continue watching, but if I run out of free time this is one of the first to be cut. I'll give this episode 3/5 trains. Goldfish Mech. 'Nuff Said. Seriously though, it's a pretty entertaining show and the interactions between the three sisters is the most interesting part of the series, I'm still a big fan of the older sister, who drinks all of her problems away :3 I think this is going to be a pretty cool series as far as things go, but I don't think it's going to be anything other than just good.